The affordability of, and accessibility to, lower cost course resources such as textbooks and supplementary materials in higher education is a growing concern in the United States. Currently, the process of textbook adoption has been left mostly unregulated at the federal, state, and university levels (Hill, 2015). In traditional settings, ultimately, the university selects the required textbooks and students are required to purchase them. In economic theory, this is referred to as the Principal Agent Problem. Essentially, the agent (university) selects the text that is best for the learning experience, but creates a financial commitment for the principal (the student) that may create hardship as price and availability may not have been in the consideration set as the university does not personally purchase the books (Investopedia, 2016a). In this case, the student can become a vulnerable stakeholder. There is another economic theory at work as well, which is Information Asymmetry. In this case, one party in the transaction (the publisher and perhaps the university) possesses more substantive knowledge about the transaction than the second party who is the student and ultimate consumer (Investopedia, 2016b). Not only are students potentially vulnerable in this process, but the cost of textbooks has been increasing at an alarming rate. 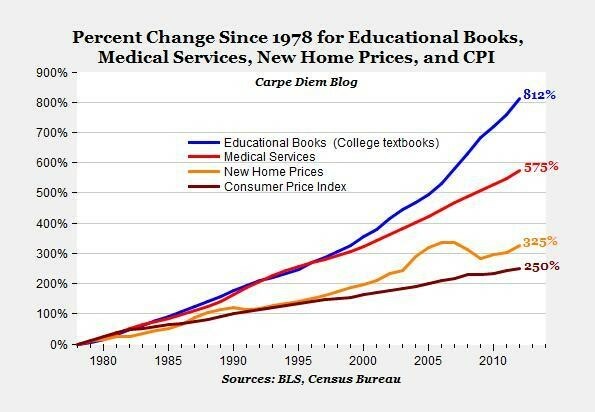 The graph in Figure 1 below is based on data from the United States Bureau of Labor and Statistics and demonstrates the astounding increase since 1978 in the cost of educational books as compared to the Consumer Price Index (CPI) over the same time. Between 1978 and 2010, the price of educational books increased 812 percent in the United States. That is nearly a third more than the increase in medical services during the same period. Furthermore, according to Weisbaum (2016), textbook prices have increased by over 73 percent in the United States over the past 10 years alone, and 30 percent of all textbooks are now purchased by students using financial aid dollars. So we know we have a problem with the increasing price of textbooks, but how do we fix it? Let me share with you how Franklin University is taking on this problem. According to Bossaller and Kammer (2014), the lowering of course resource fees is complicated, as it requires a bulk acquisition structure within an institution for savings to be realized by administration and students. Franklin is currently undertaking a bulk acquisition structure and seeing great results. Recently, the University signed agreements with the top four publishers, which represent more than 50 percent of all textbook adoptions at Franklin. The price for an e-textbook for those publishers is on average about $55. Additionally, students at Franklin get embedded access and integrated features at no extra cost. How does Franklin’s average of about $55 price per e-text compare to the national average? According to the National Association of College Stores (NACS, n.d.), the average price for a textbook in 2011-2012 was $68. Hill (2015) and NACS (n.d.) state that the NACS survey is distributed by campus bookstores to students and that the survey asks students to provide all textbook expenditures no matter where or how procured. In reality, the survey process is not perfect, but the instrument does account for such third party sources such as, new, used, rental, and lease. Further, the NACS survey asks respondents to separate supply costs from book acquisitions. This process helps to zero in on the actual average cost of textbooks. Annualized, NACS (n.d.) suggests that in 2011-2012, college students spent $655 on textbooks. At about $55 per e-text, Franklin is having great success at lowering the cost of acquisition for students to well below the $68 per text national average cost. Currently, the initiative is headed into its third semester and 36 courses will run during the summer of 2017 with more than 1000 students using the embedded e-resources. Students also have the ability to opt out of the e-text program, but thus far, only a small percentage has done so. The project is expected to be completed within the next 24 months. That said, the majority of courses will be transitioned in the next year as high enrollment courses are transitioning first. As we continue on with this project, we’re excited to increase the accessibility to and affordability of higher education at our institution in order to help our students succeed and achieve their goals.